Waberer’s, Shell and IVECO’s sole distributor have concluded a successful gas fueled vehicle test series in FTL transportation in the last two months. Due to the excellent operation data and environmental impact assessments, Waberer’s is willing to enlarge its 4.4 thousand fleet with LNG (Liquefied Natural Gas) and CNG (Compressed Natural Gas) powered IVECO trucks. The average vehicle age at Waberer’s fleet is 2.5 years, thus the company runs solely Euro 6 category diesel trucks. Though the emission of these trucks is significantly lower than those of the earlier models, the company continuously examines new technologies that may help reduce environmental impacts of road transportation. Consequently, Waberer’s conducted a months-long, comprehensive test with gas-powered vehicles with its partner DanubeTruck Ltd, sole distributor of IVECO in Hungary. ‘Natural gas fueled vehicles present a strong alternative in road transportation, as these engines run with significantly lower emission and noise pollution rates and are also suitable for long-distance transportation. This was particularly important for us as we are continuously exploring opportunities to reduce the ecological footprint of our activities. According to test results, operational costs might be lower as well. The growing number of natural gas filling stations on Europe’s roads is a great support to this trend,’ said Ferenc Lajkó, CEO of Waberer’s. Iveco was the first manufacturer in the world of commercial transport to understand, in 1991, the potential of natural gas, initiating large scale investment in developing environmentally friendly, sustainable operated range of industrial vehicles. By now IVECO has become the market leader offering a full range of sustainable solutions, from city people mobility all the way to long-haul freight. ‘LNG stands today as the best alternative fuel in long haul missions. With our advanced Natural Power technology and Stralis NP range, this alternative traction is a reality today. We are very pleased to see that Waberer’s follows its clear sustainability goals without compromising performance and recognizes the benefits that our Stralis NP can bring to its operation’, commented Pierre Lahutte, IVECO Brand President. ‘Danube Truck is proud member of IVECO family, as sole distributor in Hungary is happy to participate in the project of testing and later hopefully delivering state-of-the-art NG products to the largest transportation company in our region. Waberer’s domestic and international business units in our understanding would largely benefit from operating these LNG and CNG Stralis trucks and CNG Daily. We are excited and committed to a prosperous co-operation between our companies’, said Zoltán Zákány, executive director of DanubeTruck Ltd. According to Shell, – Waberer’s fuel card provider and IVECO European partner – operator of LNG filling stations across Europe, ‘LNG will be part of the future energy mix as it brings cleaner and cheaper alternative to diesel. 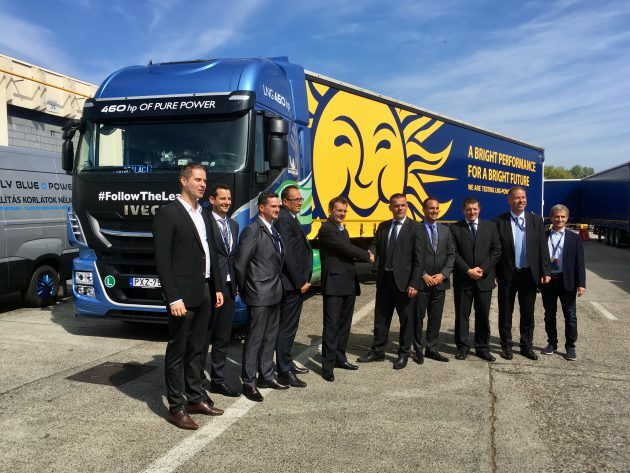 Such a long term partnership with Waberer’s and IVECO can help prove the concept and support further LNG retail network growth across Europe’, said Lajos Veér, Sales Manager for Shell Fuel Cards in Hungary and Romania. Based on the successful tests, Waberer’s may expand its fleet with LNG and CNG powered trucks as soon as 2019. The company expects that LNG and CNG fueled engines will play an increasingly significant role in transportation in the upcoming years. Shell V-Power 97 – A better Ron 97 Fuel ?